Fresh Raspberry French Silk Pie? When I heard the name for this recipe, I couldn’t imagine a more decadent and luxurious one, and the recipe has turned out to live up to it in spades. (In spades: being the language nerd that I am, I couldn’t help stopping to research the derivation of this phrase while writing this post. Turns out it has nothing to do with the gardening implement, and everything to do with spades as the highest ranking suit in the card game of bridge. Knowledge is power, kids.) Anyway, enough about language. Everyone say hello to Monica, the lovely gal behind today’s Fresh Raspberry French Silk Pie. I first met Monica on Instagram (where I knew her only as @themovementmenu). But I knew she posted crazy-delicious-looking foodporn, and she was, well, one of the friendliest accounts around! Full of energy, writing back to the folks that took the time to comment, and captioning her posts with genuine bubbly enthusiasm. Check out one of my favorite posts of her below, and give her a follow for more paleo(ish) inspo. All these gorgeous colors give me the feels. Happy breakfast to me!! When I heard Monica had a cookbook in the works, I reached out to share the word. Called Paleo Baking, it’s already available for pre-order (!) and will arrive September 20, 2016. Since it’s a baking cookbook, it’ll have everything from decadent layered cakes to quick & easy cookies and bar recipes, and plenty of (do I hear this right): DONUTS. Never fear if you don’t have a sweet tooth, there will be an entire savory chapter. Expect to find recipes for curried chicken pot pies (Jesus take the wheel) & pumpkin alfredo poutine (what the what). Anyway, this extravagant Fresh Raspberry French Silk Pie is just one of the dessert recipes found inside the book. The picture above is one I took after testing the pie myself, and let me tell you, that recipe took some abuse and still turned out spectacularly. Did I chill my coconut cream before whipping? No (so it failed to form stiff peaks). Did I have a stand mixer to beat the filling to silky smoothness? No (and I whipped it too hard with a hand mixer). Did I fully cool the crust before filling it? No (and the filling turned to soup). Give this pie a whirl, even if your kitchen isn’t stocked with a stand mixer and you don’t have time to chill the coconut cream (whip it until soft peaks form and follow the remainder of the recipe as written). Bisous! Using whipped coconut cream for decadent cloudy texture, this Fresh Raspberry French Silk Pie will be the belle of your dessert recipe repertoire. Preheat the oven to 350°F (177°C). Adjust the oven rack to the middle position. Place the almond flour and sea salt into the food processor. Pulse the two ingredients for a few seconds. Add the melted coconut oil and egg until the mixture forms a ball. Press the crust into a pie plate, up around the edges as well. Bake the almond flour crust in the oven for 12–15 minutes, or until the edges look golden brown. Pull the crust out of the oven and set aside to cool. Heat the chocolate in a microwave on medium power (about 60–120 seconds) or over the stovetop on medium-low until melted. Whisk in the vanilla and set the chocolate aside to cool. Scoop the coconut cream out of the can of coconut milk. Place it in a medium bowl, and beat the coconut cream with a hand mixer on high speed until stiff peaks form (usually 2–3 minutes.) Cover and refrigerate the cream. In the bowl of a stand mixer, beat the softened butter on medium speed for just 1 minute. Add the coconut sugar and continue beating until light and fluffy, about 3–5 minutes. Pour in the cooled chocolate to the mixture and beat until well incorporated. Add 2 of the 3 eggs and beat on medium speed for about 3 minutes. Add the remaining egg and beat for another 3 minutes until the mixture is smooth. Refrigerate the pie for at least 2–3 hours, but preferably overnight. Decorate the pie with the prepared coconut milk whipped cream and fresh raspberries. Voilà! This looks AMAZING! Going to have to show my wife this, she’d love it, too!!! It’s one of the most amazing desserts I’ve ever made. I bet your wife would LOVE it! That pie looks good. I haven’t tried that type of pie before… But it looks appetizing. Ha, yes it’s a little bit unusual but all the more wonderful for that reason. Wow! This pie looks divine! Perfect title too, because it really does look sooooo silky! Fabulous post. I love the look of this and I always give paleo desserts the party test. If you show up to a party are people going to say “Are you the one that brought the paleo dessert?” Or are they going to say “Are you the one that brought the best dessert?” This looks like a best dessert. You said it. Totally the test! You’re SO right. I made this pie for the first time and brought it to my sister’s graduation party. People were coming up to me left and right, asking me how this pie could possibly be paleo! Almond flour is a Godsend! Being gluten intolerant has opened my eyes to so many other delicious flours. Your pie looks fabulous! Yes, there are tons of options out there now for the gluten-intolerant. Happy baking! Oh my! All of these look so amazingly delicious. Yum! This looks AMAZING! I love raspberries with chocolate! i am dying. my husband and i have been paleo for almost 2 years and I am always looking for delicious treats! this looks amazing! pie is my husbands fav!! thanks for sharing, i cannot wait to make this. Oh, good! Yes, have not seen too many other paleo recipes for French silk pie out there… Hopefully this one is an acceptable substitute! This pie should impress the both of you. 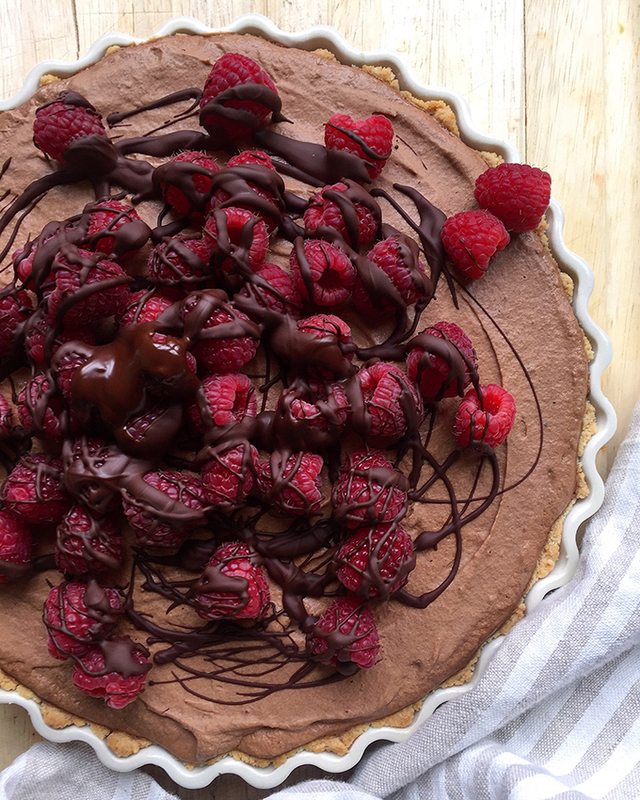 If you’re looking for more paleo delicious treats, this pie is from my upcoming cookbook Paleo Baking. You can check out the book on Amazon! bit.ly/PaleoBakingBook 🙂 Thanks for your support! Um yes! This is shaping up to be my new favorite desert! OH MY GOSH…my mouth is watering. I will be pinning this and making IMMEDIATELY! That pie looks amazing! I love french silk pie! That looks heavenly!! So delicious! Ha, I wouldn’t recommend it. But in this case, the story had a happy ending! I do not know for sure, but I think it’s likely it would work!